The Sydney Swans have won the “Battle of the Bridge” local derby against cross-town rivals the Greater Western Sydney Giants by 21 points at th SCG. Played in balmy, summer like conditions, both teams attacked the ball hard, but it was the Sydney Swans who were able to capitalize on their efforts early and place scoreboard pressure. 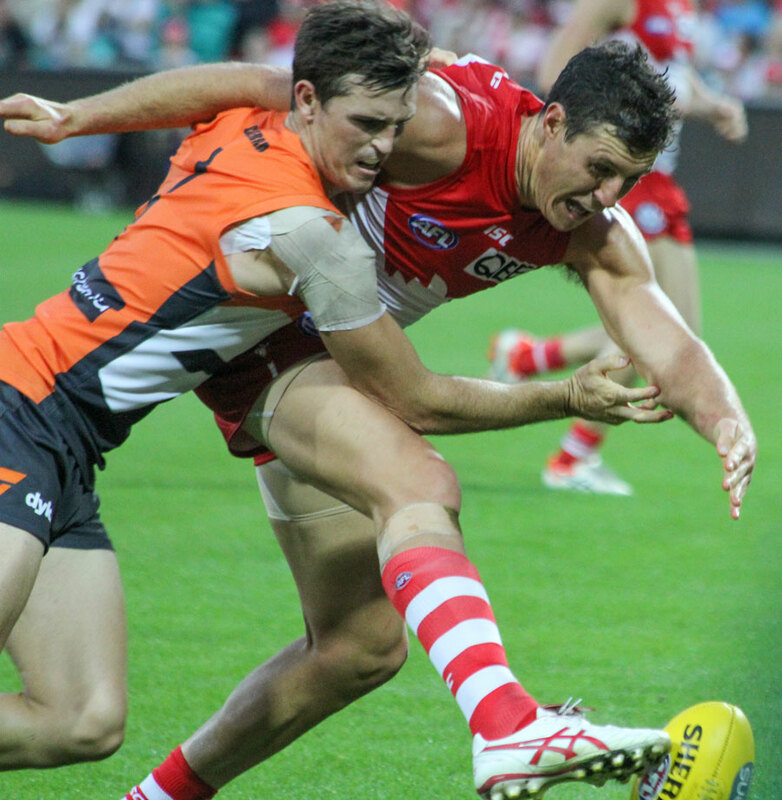 The GWS Giants had plenty of the ball but were unable to convert their opportunities due to mistakes and constant Sydney Swans pressure. Superstar Sydney forward Lance Franklin booted 5 goals in an impressive effort considering his opponent was the experienced defender in Joel Patfull. The dual was an entertaining one and whilst Franklin won on the scoreboard he was made to work hard for his goals. For the Giants a bright spot up forward was the work of Rhys Palmer who kicked 3 goals, including a lovely snap in tight traffic.Post-game, GWS Giants coach Leon Cameron lauded Palmer’s efforts and said he was pleased not only with his goal scoring efforts, but his ability to chase down and put pressure on the Swans defenders during contested clearances. Awful kicking really did hurt the Giants chances of winning the game. They kicked 1.6 in the first quarter and 2.7 in the second and at least 4 of those shots were gettable. In terms of Sydney’s game they were impressive and continue to show the form that made them one of the best teams in last years competition. The usual suspects in Kieren Jack, Dan Hannebery, Jarrad McVeigh and Josh Kennedy were all major contributors in the victory, amassing 111 disposals between them. The Swans backline shows no signs of weakness either. Despite the departure of key player in Nick Malceski who left to join the Gold Coast Suns, Heath Grundy, Rhyce Shaw, Dane Rampe and Ted Richards were stout and were the architects of many an attacking drive for Sydney. 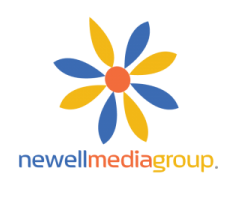 The poor disposal by the Giants at crucial times in the game were extremely costly. Midfielders in Lachie Whitfield and Toby Greene gave up the ball all too easily and as good sides do, they were punished with replying goals. Greene in particular is a serial offender. Whilst he gets plenty of touches of the leather, his disposal skill are seriously wanting and it is an area he must improve on if he is to be a match winner for his team. The other headline getter was the incredible game played by Swans rookie in Isaac Heeney. This boy already looks like part of the Swans furniture which is incredible considering it was only his third game of AFL senior football. Heeney slotted 4 goals including a spectacular finish which saw him kick and goal and then slam hard into the post. Heeney bounced up and played out the game. 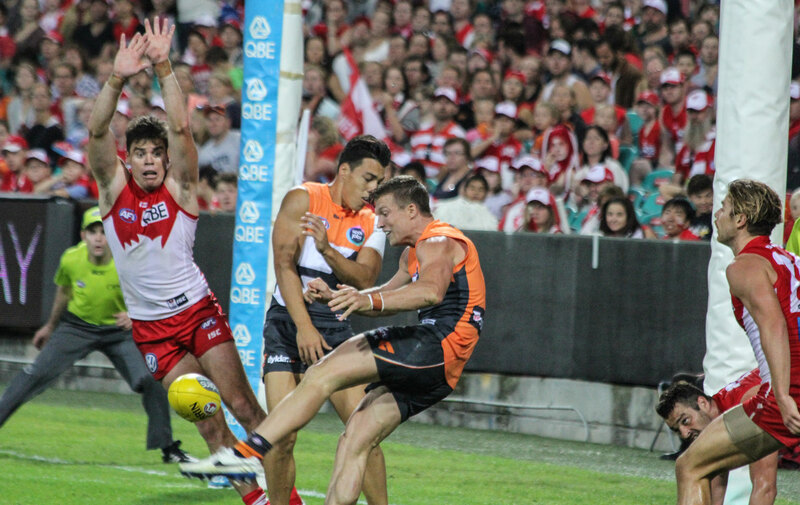 Giant midfielder Tom Scully had a very serviceable game for his team. Scully had 27 disposals and kicked a gola. He continues to impress with his run around the midfield and will be a key peice of the Giants mid-field puzzle as the season progresses. For Sydney their next assignment couldn’t get any tougher when they venture across the Nullarbor to face the red-hot Fremantle Dockers who will be seeking revenge after their preliminary loss to Sydney last year. 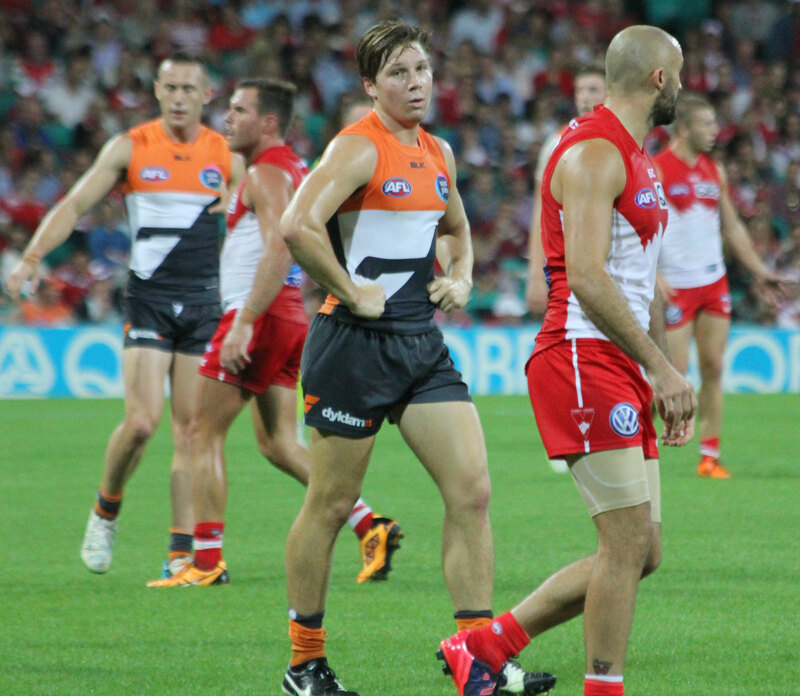 For the GWS Giants they face a desperate Gold Coast Suns in Canberra on ANZAC Day on Saturday.